That’s when it hit me: I had no idea. Somehow it had never occurred to me how much work went into making the home’s menu. Mom always just knew what we were eating, so I would just know, too (as if by setting up my own rotating utensil-caddy some compartment of my brain would unlock and out would flow all the secrets of homemaking). I panicked. Just find a recipe, buy ingredients, and cook. Why was this so hard? I sat in the same spot on the couch with my iPad for no less than 4 and a half hours that afternoon, scouring the Internet, trying to figure out the first real dinner we would share in our new apartment (the PB&J’s and Fruit Loops we’d been sustaining on through the big move-in didn’t seem to count). I just wanted so badly to be good –to not identify with any of the “new-wife’s cooking” jokes or horrors told and retold and exemplified through sitcoms (even though I had been equipped for years with cooking basics, tricks, and recipes from my mother). Put it in writing. One convenient day a week, come up with as many meals one trip to the grocery store will allow, and jot it down. 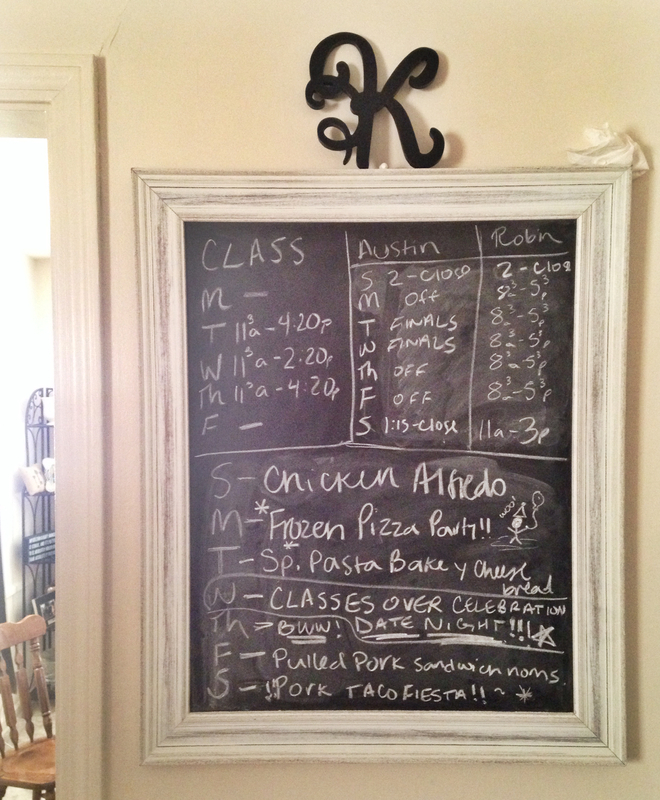 I chose this big chalkboard in our kitchen that has all of the daily components I’m trying to plan around (different jobs and classes), as well as the weekly meal plan. Don’t limit yourself either -draw pictures! Try and make it fun. It’s also nice to have a big, visible reference board (and a nice reminder if I’m supposed to get a crock-pot started before work). Just trust what skills you have, and realize you will be eating dinner every day. Everyday. Which means every day, you get another chance to redeem yourself if something burns, goes flat, or tastes funny. But I’ve found that meal planning is an easy way to curb new-wife cooking anxiety and save some serious time and money. Home Sweet …How did I get here?